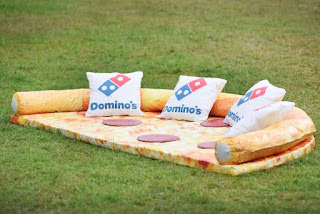 For those who dream of eating a slice of pepperoni pizza while sitting on a giant pepperoni pizza, Domino's UK has come up with the Pizza Boy Sofa. The floor sofa consists a half-circle pad covered in a melted cheese and sauce graphic, topped with "pepperoni" seat cushions(?) with a tube "crust" rounding the outer edge of the circle for you to lean back on. Finishing off the look are four throw pillows decorated with the Domino's logo. The Pizza Boy Sofa recently made an appearance at the UK's Isle of Wight music festival but it doesn't look like the chain is selling them (yet). However, Domino's gave one away just yesterday to one lucky UK fan via a sweepstakes on their social media channels.